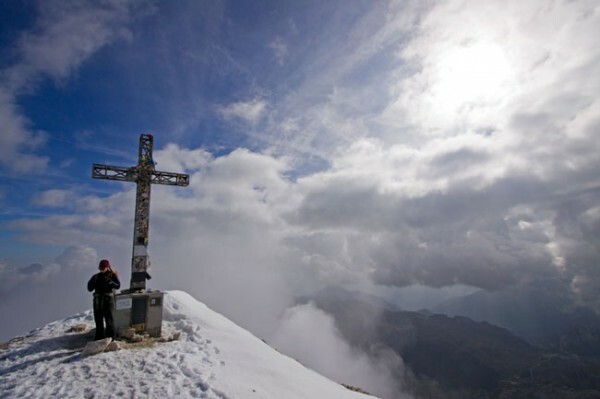 On the summit of Tofana di Rozes, in Eurpoean terms- 3244m, 2 deg. C and 15 cm of new snow. You do the conversion. And the honeymoon continues. A day after the warmup on Punta Fiames we decided to hit something bigger. 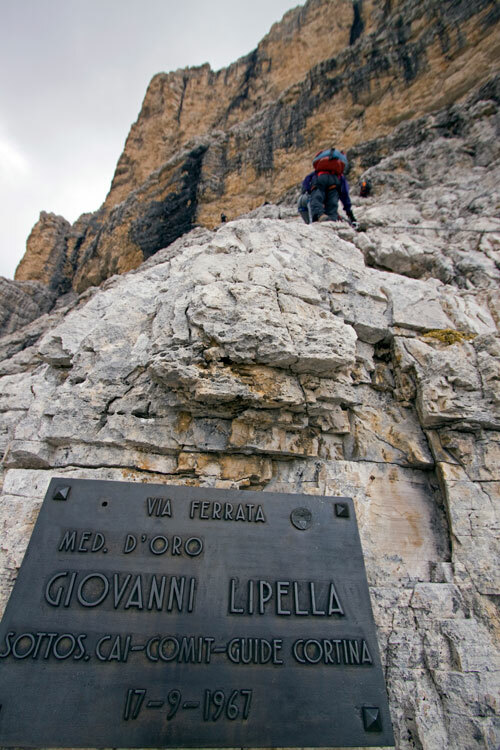 Highly recommended by friends and guidebooks alike, the Via Ferrata Giovanni Lippelli on the Tofana di Rozes was said to be a must-do. 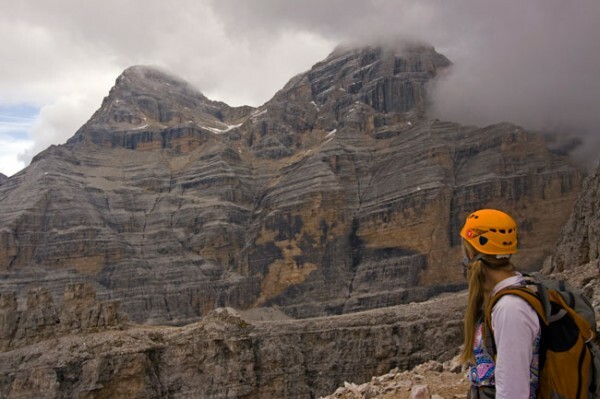 The Tofana group is comprised of three separate peaks– Tofana di Rozes, di Mezzo and di Dentro– and with each just over 3200 meters, they represent the highest summits of the Dolomites. 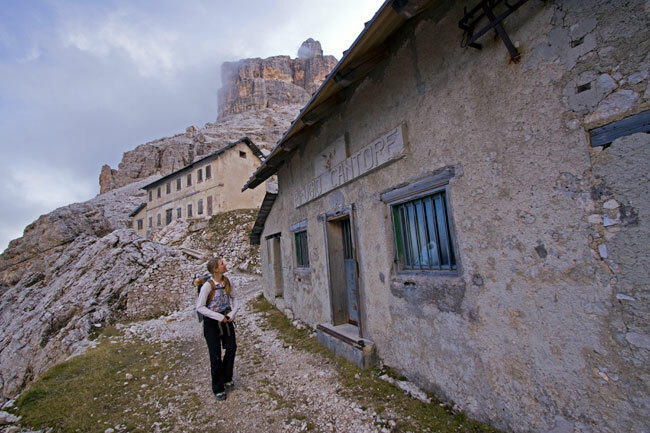 Appealing to climbers for obvious reasons, they were also considered locations of strategic interest in the WWI days which resulted in the establishment of extensive tunnel networks and several via ferrata which, nearly 100 years later are as popular as ever. 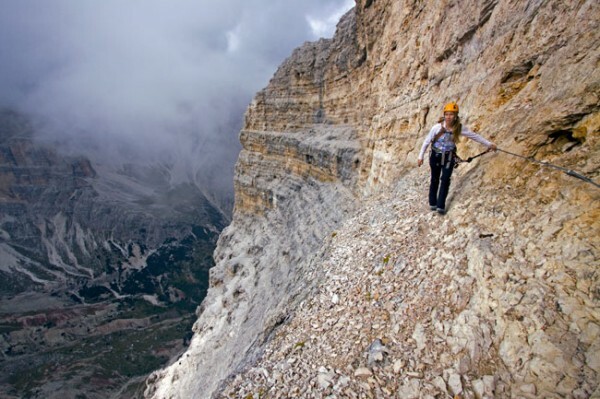 Via ferrata are rated two ways. 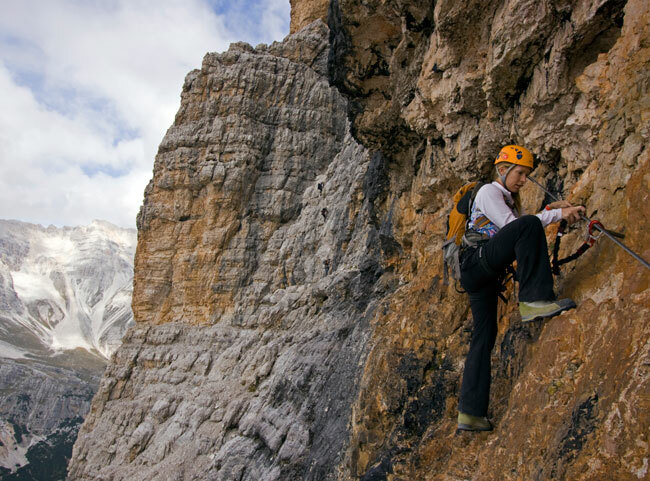 The difficulty is measured on a scale from 1 to 5, with a 1 being an easy hike and a 5 having considerable technical challenges, exposure and at times requiring real climbing moves. The commitment level is measured separately, from A to C, with an A grade having easy escape(light commitment) in case of weather, emergencies or the like and a C, well, it’s two notches higher so if you’re clipping into a grade C, know that once you start you can’t easily turn back or simply decide that you’ve had enough. The route marked in red, as seen from VF Tomaselli, our next objective. 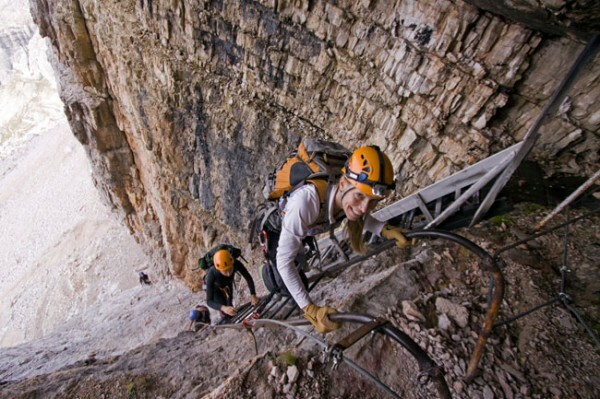 It’s a mix of airy traverses and uphill climbing, long on distance and exposure. Click any photo to enlarge. The route begins with a 10-15 minute hike through an old wartime tunnel, accessed by this ladder. No kidding, it climbed up inside the mountain until we popped out the other side, with a few hundred vertical feet gained. Headlamps required. Heading towards the light and following the cable, claustrophobia turns to vertigo in seconds when the route changes from a tunnel to an airy ledge on the side of the mountain. 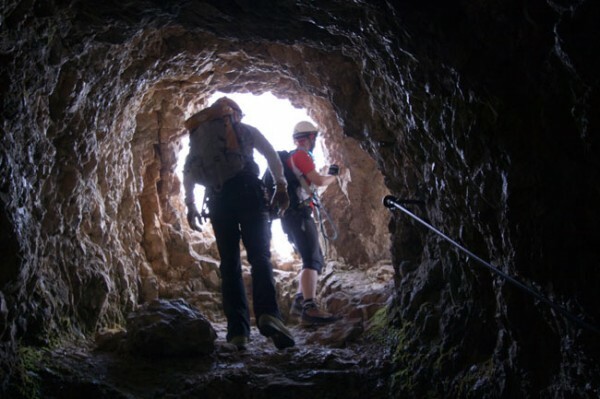 Out of the tunnel, after a short cable traverse, the trail hikes on a wide unprotected ledge which leads to the true start of the route, here. 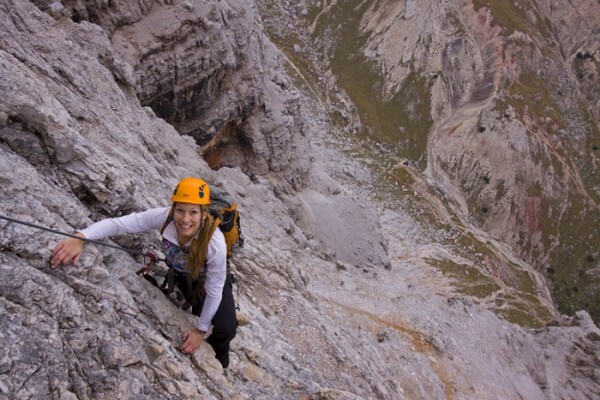 As Christy passes an anchor on a traverse, three climbers can be seen ascending in the background. As with many of the routes, old cables and anchors have been upgraded. “Bomber” is the proper way to describe this protection. The trail from the tunnel can be seen below. Still smiling and climbing the rock rather than ‘hang-dogging’ on the cable, the moves may not often exceed easy class IV but the exposure and heights reached make the protection much welcomed. Halfway, after the long left traverse as seen in the earlier route photo, an overlook is reached with awesome views of Tofana di Dentro and Tofana di Mezzo (L to R). It is possible to exit the route here with an traverse to the descent route and the Rifugio Giussani, if needed. Continuing on, the angle increases and some crux moves appear. Wet rock from melting snow added to the challenge. 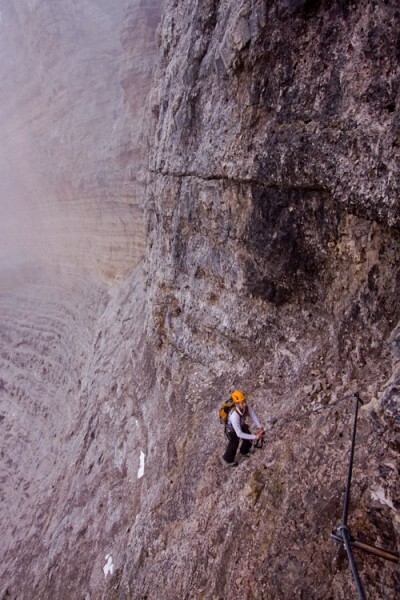 The route ascended this steep basin and two climbers can barely be made out, down and to the left, on the lightest colored rock. Like the book reads,”it keeps on coming!” We actually experienced some ‘cable fatigue’ after a while, it was almost six hours on the VF itself after which we joined the hiking/descent route for another thirty minutes to the summit. Near the summit the angle eases and the route walks to the summit, with some 15 cm(“when in Rome,” right?) of new snow on the ground. 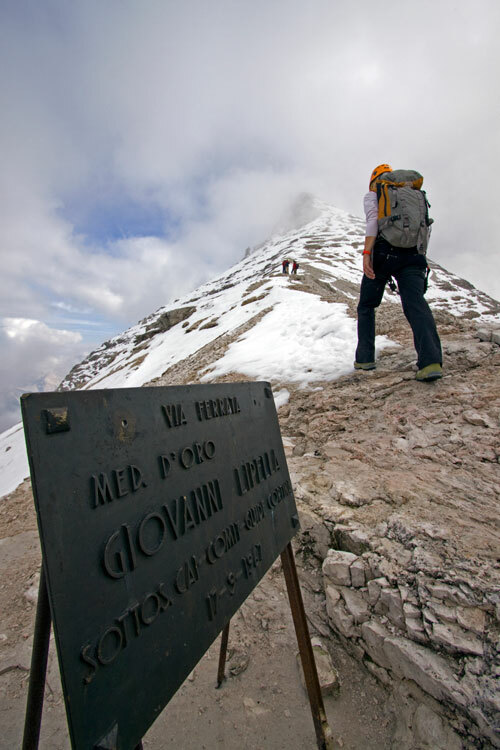 No confusion here as to the true summit location. 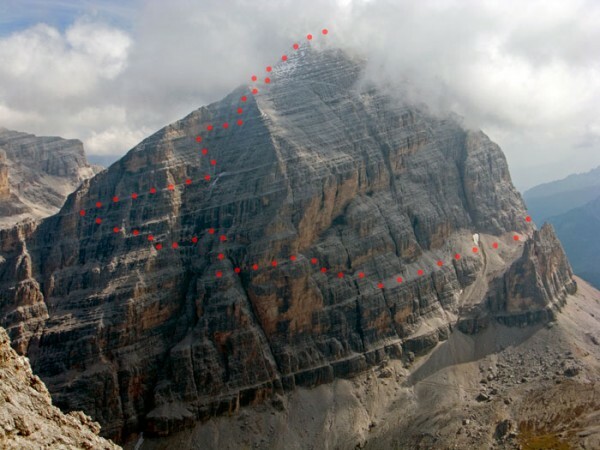 It’s interesting how many peaks around the world are marked with crosses. This was a big one. The clouds look stormy but we never heard or saw any thunder or lightning and they never developed into anything. The descent route– an easy hiking trail– heads to the saddle in the shade to the right, where the Rif. Giussani and the closed but still erect WWI era outpost, Rif. Cantore are located. This pass was yet another important war position. The other two Tofana peaks, di Dentro and di Mezzo make up the backdrop. 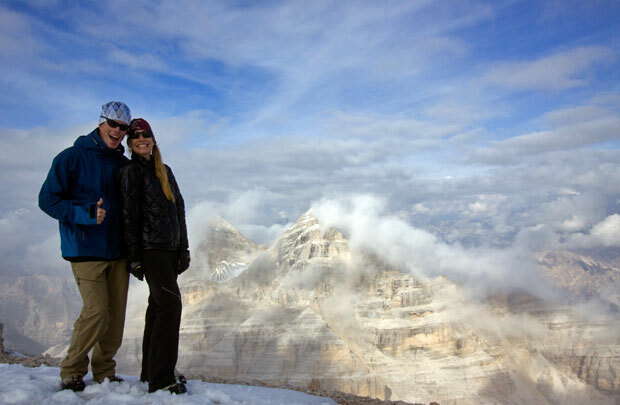 It’s rare for sure to be able to feel like you’re being a tourist while bagging peaks at the same time. Like historical ‘walking tours’ these VF are more like historical ‘climbing tours.’ I don’t know if the entire VF was from WWI or instead established later above the tunnel, but for nine hours up and down we traveled in the footsteps of the soldiers, and it was fun to visualize it along the way. And next up, the VF Tomaselli on Punta Sud, a solid 5C. Hey Ted, doesn’t your wife ever take pictures of you? Oh, her camera… it’s finito! Wow! Amazing shots. Lots of exposure on those VF’s – good the cables are indeed bomber. For the record, I think it should be noted that Christy was wearing Broncos’ colors from their game against NE. Yes Christy, until your camera turns up the pics will all be of you. I’ll do one more post on the trip so you have some time to locate it. Ann- yes, it’s exposed but I also picked out the more dramatic shots from the day. This particular VF had plenty of moderate stretches. Scott- She’s always been the fashion trendsetter, not that those uni’s were anything but ugly. I think I might be one of the few people who actually liked those uniforms. I think you were probably in the vicinity of where Hemmingway was during World War I and his experiences led to “A Farewell to Arms” which, despite what some have said, is not about Def Leppard. 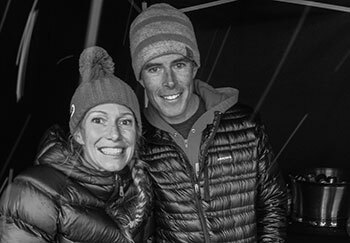 T&C – great to see these shots – makes me want to go back alreeady! I know Penn, we didn’t get to everything we would have liked and would love to go back. It was a great preview but late Sept. is too late, nearly all huts and lifts were closed, apart from the tram at Falzarego Pass. Cinque Torre hut was closed and the tram down from VF Punta Anna was closed too and with the new snow up there we thought it might be too hairy a descent. 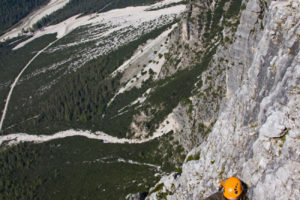 We did get a different VF5(Tomaselli) done and two days of sport climbing. And when we were atop Punta Fiames, there were two Italianos topping out on the trad route you and Kir hit, which looked awesome as we descended below it. We’ll just have to go back.